A DIY Backyard Wedding in New England can be whatever one wishes it to be. A “Do it yourself” wedding gives couples the freedom to make their wedding day completely their own. This DIY Backyard Wedding in New England was held at a private estate in Fairfield, Connecticut. The wedding was unique to the couple, who determined every detail that made up the ceremony and reception. One of the pieces of the reception that made the event extra special was the renting of authentic wooden church pews. These wooden pews were placed on the lawn for the couple and their guests to sit in throughout the outdoor marriage ceremony. This picture shows a tender family moment between the flower girl and her parents. The flower girl’s mother and father sit calmly in the pew, feet stretched out on the lush green lawn. The flower girl has been behaving herself all morning and afternoon, keeping her curled hair intact and her flower girl dress pristine. She performed her task of throwing petals along the grassy aisle between the pews, and then sat as peacefully as she could manage for the majority of the ceremony. Being a young child though, she was bound to get a bit antsy. Once her mother saw the little flower girl beginning to fidget, she swooped her daughter up into the pew. 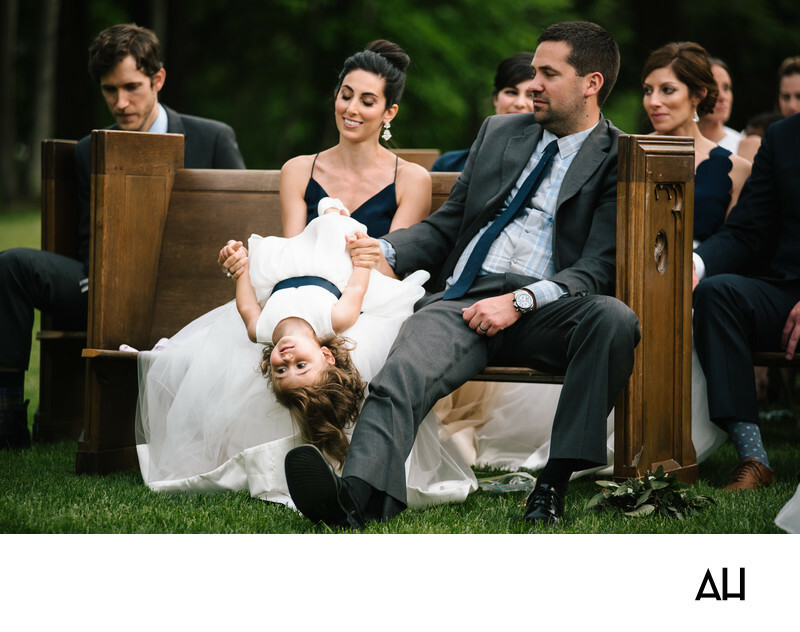 The flower girl’s mother dips her back off her lap so that she can watch the wedding before them upside down. The mother laughs quietly, as her husband looks over at his wife and his daughter playing. There is affection in his eyes as he watches the pair, and he places his hands on the little girl’s ankles for security. It is a happy moment shared on a day abounding with joy.